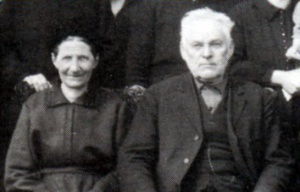 Johann S. and Katharina (Peters) Rempel. Johann S. Rempel: successful Mennonite farmer and inventor; born November 9 1853 to Johann (1830-1899) and Margareta (Sawatsky) Rempel (1833-1914) in South Russia. Johann was baptized 28 May 1873 and in 1874 he immigrated to Canada with his parents, settling initially in the village of Grunthal, on the Mennonite East Reserve in Manitoba. He served as Vorsänger (leader of congregational singing) for many years in the Chortitzer Mennonite Church. Johann moved to the village of Chortitz where he met and married his first wife, Katharina Peters (1852-1890) in 1878. Together they had nine children, four of whom died as infants. A year after Katharina died, Johann married her younger sister, Margaretha Peters (1870-1934). This marriage produced 11 children, two of which did not survive to adulthood. Rempel gained a reputation as an inventor. A grind stone and a grass mower are just two of many things he is reported to have invented. He built a large house which was always open to guests. Teachers and preachers who came to the village for special meetings often spent the night at the Rempel home. Because he had learned a little English during his first year in Canada, he was soon involved in municipal affairs and was appointed secretary-treasurer by Immigration agent William Hespeler. Johann supported public education. He also spoke out repeatedly against smoking. Because of his early use of the English language, he was nick named "Änglischa Rampel." Johann loved to sing, having come from a very musical family, and even traveled to perform in other communities along with other musicians. Johann S. Rempel died suddenly on 28 May 1929, after a lifetime of serving his family, church, and community. Rempel, Cornie. "Johann S. Rempel-Addendum." Preservings No. 7 (December 1995): 31. Unger, Helen R. "Johann S. Rempel." Preservings No. 7 (December 1995): 30. Brown, Sharon H. H. "Rempel, Johann S. (1853-1929)." Global Anabaptist Mennonite Encyclopedia Online. March 2006. Web. 24 Apr 2019. http://gameo.org/index.php?title=Rempel,_Johann_S._(1853-1929)&oldid=101746. Brown, Sharon H. H. (March 2006). Rempel, Johann S. (1853-1929). Global Anabaptist Mennonite Encyclopedia Online. Retrieved 24 April 2019, from http://gameo.org/index.php?title=Rempel,_Johann_S._(1853-1929)&oldid=101746. This page was last modified on 22 September 2013, at 06:07.